In Your Dreams drops 44 places to # 92 from # 48 last week for the week ending July 21, 2011. This is it's 4th week on Ireland's Top 100 Album Charts. 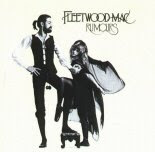 Fleetwood Mac's Rumours re-enters the Top 100 at # 83 also. In The Netherlands, Rumours drops to # 19 from # 11 last week for the week ending July 23, 2011 on the Top 50 Catalogue Chart. 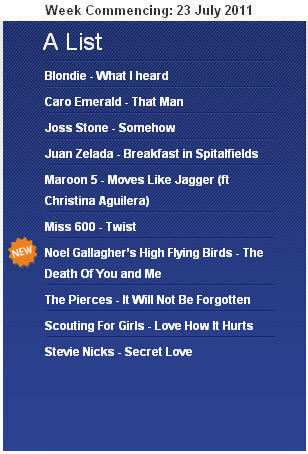 In the UK - Stevie's first single 'Secret Love' remains on the A List on BBC Radio 2's playlist for the week commencing July 23, 2011 guaranteeing multiple plays across a broad selection of BBC Radio 2 programmes. The single drops down to # 35 from # 28 last week on The UK Radio Airplay Chart. for the week July 17 - 23. Fleetwood Mac and Stevie Nicks are still dominating the Australia Album and DVD Charts... Fleetwood Mac's The Very Best Of remains at # 2 this week on the catalogue chart, Stevie's Crystal Visions moves down to # 23 from # 21 last week and Fleetwood Mac's The Greatest Hits moves up to # 28 from # 32 on the catalogue charts. On the Top 100 Albums Chart Rumours drops down to # 52 from # 30 last week, Stevie's In Your Dreams moves lower to # 82 from # 72 last week. On the Top 40 DVD Charts, Fleetwood Mac's The Dance moves up to # 16 this week from # 23 last week. Stevie's Live In Chicago DVD moves up a couple of spots to # 37 after re-entering the chart last week at # 39. 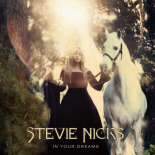 In the UK, Week 4 for Stevie Nicks 'In Your Dreams' moves slightly lower to # 61 from # 55 last week while Fleetwood Mac's 'Rumours' moves up to # 13 from # 19 last week on the Top Catalogue Chart.